This article discusses oil and energy related concerns for BDC investors. In two weeks, BDCs will begin reporting updated results including NAV per share and impacts to portfolio investments. Currently the average BDC has around 7% to 8% of the portfolio invested directly in oil and energy related companies. I have recently conducted a survey regarding these issues and the results are displayed in real time after each response, so please visit the following link to participate. There are now almost 200 responses and I will update the results in my next article. As a yield oriented investor, I have invested in many stocks related to oil but sold most of them in 2008 and reinvested the proceeds in business development companies ("BDCs") in 2009 including Apollo Investment (OTC:AINV), Ares Capital (NASDAQ:ARCC), BlackRock Kelso Capital (NASDAQ:BKCC), Fifth Street Finance (FSC), Gladstone Capital (NASDAQ:GLAD), KCAP Financial (KCAP), Main Street Capital (NYSE:MAIN), PennantPark Investment (NASDAQ:PNNT) and Prospect Capital (NASDAQ:PSEC). At that time, most of these companies were yielding 20% to 30% and I held many of these until yield compression started to drive dividend sustainability concerns. I do not consider BDCs as an investment only in the financial sector and one of the reasons that I prefer them to other higher yield investments is because they invest in multiple industries. Currently the average BDC has 7% to 8% of the portfolio invested in oil and energy related companies. BDCs will begin to report results in less than two weeks and oil/energy related concerns are likely to be a topic of discussion for BDCs with larger amounts of exposure. This includes portfolio companies and other investments such as collateralized loan obligations ("CLOs"). 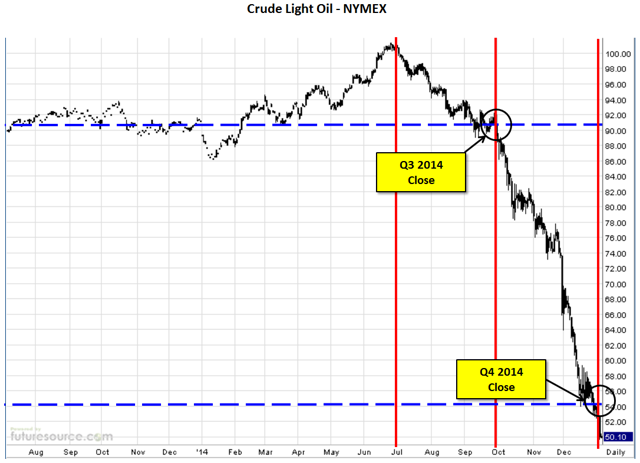 Last quarter this was not as much of an issue because crude was still in the $90 range as of September 30, 2014. By the end of calendar Q4 2014 it was closer to $54 and could impact asset values and ultimately net asset value ("NAV") for some BDCs. The truth is that there is no way to determine the amount of risk for each portfolio company, many of which are private with very little information available. Another important factor is the loan agreements with these companies including security and protective covenants. 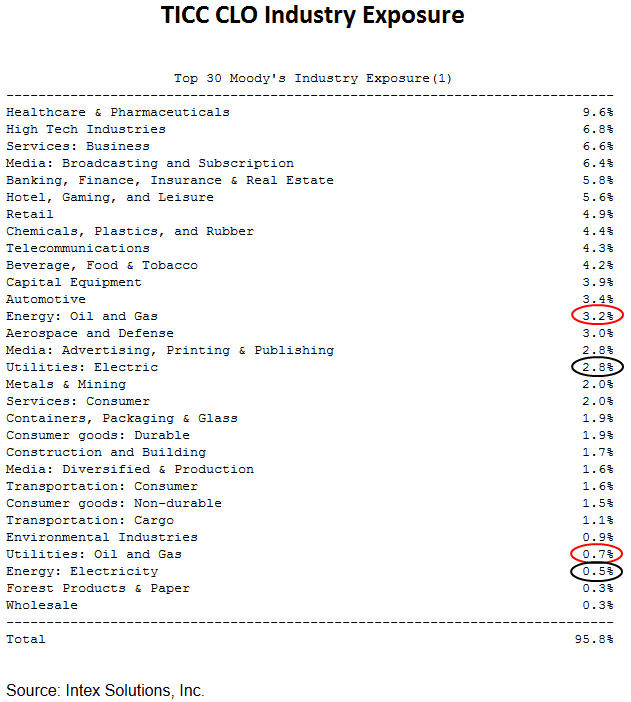 Not all oil related companies have the same amount of exposure to commodity prices. 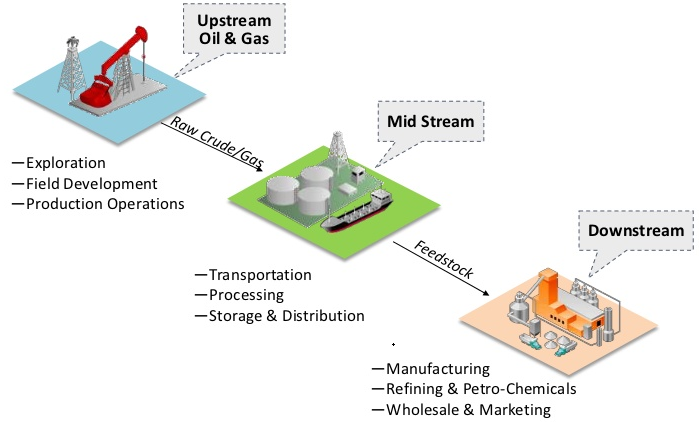 Midstream and downstream investments are less influenced by the price of oil compared to upstream assets that are usually the most at risk. Drillers and E&P companies are usually impacted by commodity price declines the hardest, especially 2nd lien positions. This is an overly generalized view of the industry. "A situation where the futures price of a commodity is above the expected future spot price. Contango refers to a situation where the future spot price is below the current price, and people are willing to pay more for a commodity at some point in the future than the actual expected price of the commodity. This may be due to people's desire to pay a premium to have the commodity in the future rather than paying the costs of storage and carry costs of buying the commodity today"
Also there are plenty of companies that have oil as an input to the process that will directly benefit as well. Obviously most industries related to consumer expenditures will ultimately benefit from low oil prices. One of the big questions is how would energy prices in general will be impacted if oil prices remain low. This could have various impacts to different BDCs including Hercules Technology Growth Capital (NYSE:HTGC) and Horizon Technology Finance (NASDAQ:HRZN) that invest in 'cleantech' or renewable technology companies. Collateralized loan obligations ("CLOs") have higher yields than other investments and are considered "unqualified" investments. BDCs are allowed a maximum of 30% of the portfolio in these types of investments due to the amount of risk involved. Many CLO investments use off balance sheet leverage to increase returns and can be levered up to 10 times. Most of the CLO investments for PSEC, KCAP and TICC Capital (TICC) are considered "residual interest" or subordinated securities in these vehicles and are the last in line to be paid, and the first to be cut off if the underlying investments default. So a small portion of the loans could cause significant changes to the amount income and valuations for these investments. "Payments to us as a holder of CLO junior securities are and will be made only after payments due on the senior secured notes, and, where appropriate, the junior secured notes, have been made in full. This means that relatively small numbers of defaults of Senior Secured Loans may adversely impact our returns." TICC has disclosed the amount of oil/energy related exposure in its CLO portfolio investments that account for 30% of the total portfolio. PSEC has many CLOs with 5% to 10% exposure to oil/energy including Brookside Mill CLO Ltd, Halcyon Loan Advisors, Mountain View CLO and Octagon Investment Partners but is currently selling some of these investments. Calculating the value of BDC investments is not straightforward, especially for CLOs as pointed out by Scott Kennedy in "PSEC's NAV Sustainability Ananlysis". Many times the Board of each company appoints a third party valuation manager to determine the value of the assets. However there is quite a bit of leniency in fair value accounting standards for many of these investments including CLO valuations (especially given the amount of off balance sheet leverage used). The question is whether the valuation firm chooses to writedown certain assets. TCP Capital (NASDAQ:TCPC) earnings call on November 6, 2014. Q. "Can you speak with a little bit more specificity on just the segmentation of oil and gas subtraction 3.6% of the portfolio?" A. "Some of these categories are broad and that doesn't mean that's necessarily where the whole of the revenue was derived from these companies and some of them have hedges in place so they're not likely to be impacted in the near term. But clearly those companies in that sector are more likely to be directly impacted." Q. "Can you just speak to kind of your direct or even your indirect impact the recent energy volatility may have on your portfolio and how does you're underwriting protect against that volatility and to what you does protect against volatility in the energy markets?" A. "The direct portion of our portfolio that is acted by energy is relatively small; indirectly it's going to be significant. If energy prices specifically stays down but a tax rebate consumers in a pretty significant one. That's going to benefit lots of companies in terms of bring up spending power for people. At the same time expenditures in the energy sector have driven a lot of growth in the economy and to the extent that oil prices remain down and company start to recalibrate their spending there will be both less spending on some suppliers and on related services particularly in a few geographic areas. We don't have any particular geographic concentration. So it's something that we're monitoring very closely going forward and thinking about a lot and trying to model a series of different scenarios with respect to how it's going to impact the portfolio." Medley Capital (NYSE:MCC) earnings call on December 9, 2014. Q. "So, if we think about one of the things we hear a lot about is that the lending is taking place in a secured basis, it is - it's hedged, but one of the things about particularly on the services side is that you really can't hedge against lower activity. And so even if the exposure directly to production is hedged at some point on the services side if there is less drilling and there is less activity in development, then that's going to hurt the EBITDA. And so you maybe in at only EBITDA at 2 times, but business falls in half and suddenly you are 4 times. So, do you have any thought as to when you are underwriting this to address the possibility of lower activity?" A. "I think you hit the nail on the head. If you are at 2 times and change and it cuts in half, you go to 4. If you set out for 4 times EBITDA and you knew it was stable, you would prefer to be lower, but that would not be the end of the world. What we have experienced is when you go from 2 times to 4 times it actually feels a lot worse than just saying your 4 times, because the trend is coming against you. So, you are looking at things like collateral value, you are looking at things like equity injections from sponsors, you are looking at strategic activity that will likely pickup in the sector to get leverage over fixed cost. So, I think if you are right or your prediction about the direction happened, we would all be faced with 4 times credit. We are happy to be first lien. That's certainly a better place to be, but yes, that would be under more pressure in those positions, I think we all would." GLAD, PNNT, AINV and MAIN have higher than average amounts of oil and energy related investments. Many of the BDCs with lower portfolio yields have much less including PennantPark Floating Rate Capital (NASDAQ:PFLT), Solar Senior Capital (NASDAQ:SUNS) and Golub Capital BDC (NASDAQ:GBDC). This article could have been much more thorough and after BDCs report year-end I will probably follow up with a new oil/energy series. I suggest that investors take the time to go through the portfolio investments for the BDCs they are interested in or currently own. Keep in mind that there are many companies that directly support oil and energy related companies or have large customers in these industries. This information is usually not clearly identified in investor presentations or SEC filings. In my opinion low oil prices are a positive for BDCs and could be similar to a temporary tax relief stimulus for consumers and some businesses. For more information about BDC exposure and risks please see my "BDC Research Page" and for information on specific BDCs please visit my "Index to BDC Articles". Disclosure: The author is long AINV, ARCC, BKCC, FDUS, FSC, FSIC, GBDC, GLAD, HTGC, MAIN, MCC, NMFC, PFLT, PNNT, PSEC, TCAP, TCPC, TICC, TSLX. The author wrote this article themselves, and it expresses their own opinions. The author is not receiving compensation for it (other than from Seeking Alpha). The author has no business relationship with any company whose stock is mentioned in this article.